As an Innkeeper for twenty five years, I’ve learned what’s important to our guests when making this decision. Cape May is really just a small town of 1 & ½ mile long by 1 mile wide at the very end of the State of New Jersey and is boarded by the Atlantic Ocean. 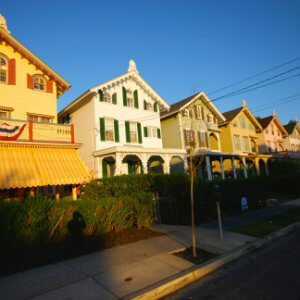 Cape May is the oldest seaside resort. Basically, you can walk to mostly anything. We consider the center of town to be the Washington Street Mall. During the summer months, people love being able to see the ocean and be close to it. Cape May pricing of course is highest on the beach if you must stay there. Proximity to the Washington Street Mall is also important. We have lots of choices from a modern hotel to a Victorian Inn. With Google today, you can find out how close the property is to the beach and the mall just by checking the address during your search. 2) How close is it to the center of town (“the Mall”) and the beach? 3) How many people are in our party? 4) What type of room or suite do we want? 5) Do we want to cook? 6) Are we bringing children and what are their ages? 7) What types of extra amenities like bicycles, beach chairs, etc. do we want from your Cape May Inn? Cape May accommodations book up before many of the surrounding areas like Wildwood, Stone Harbor etc.. Cape May has a variety of websites that can really help you with your decision. Our town has a local Chamber of Commerce website. In their accommodations section, you will find key categories (Bed & Breakfast, Guest House, Apartments, Suites, Condos, Hotel/Motel). Another handy group is called Cape May Historic Accommodations (CMHA) and this lists 40+ historic lodgings & Inns built prior to 1920. Their website will allow you to search by amenity. Each week they rotate their hotline direct phone number among the Innkeepers for last minute openings from 11 A.M. to 7 P.M. at 609-884-0080. Wait till 11 A.M. since many of the Innkeepers are still serving breakfast. If you have children, most Bed & Breakfasts require older children (8 and up or even age 12). It varies by each Inn. The local chamber has all of the accommodations types. For younger children go to an apartment, suite or even sometimes a guest house or condo. Hotel and Motels always take children. If you want a historic place definitely check out the CMHA website. It’s embarrassing to both the Innkeeper and you (the new guest just arriving) when they say at the door “Sorry but we do not take children”. Remember these places tailor to mostly couples who might want to have a romantic getaway without kids. Always ask. An online reservation will not tell you about this unless you read the fine print on the web. A few more local websites to check out is Capemay.com (has handy list for Coast Guard and pet friendly places) and Capemaytimes.com. If you must have a swimming pool, most Cape May Hotels and Motels have them. The only Victorian Inn that has a pool is the Wilbraham Mansion in West Cape May. There is a public pool in North Cape May. For a single family home, contact our local real estate offices. HomeAway.com and VRBO.com are also good websites to narrow in on your search with filters. These websites have 300+ Properties to choose from. The internet has lots of websites that will also help you (i.e. Booking.com, Expedia etc). Remember that rates could be higher due to commission rates charged to the business. Use them to find openings but then go direct to the Inn and you could possibly save. Have a wonderful stay in Cape May and we hope to welcome you to Antoinette’s Apartments & Suites, only one block from downtown Cape May and then 3 shorts blocks to beach. This entry was posted in Accommodations, General by acorn. Bookmark the permalink.